Have you heard the news? We got a makeover and it never felt so good! 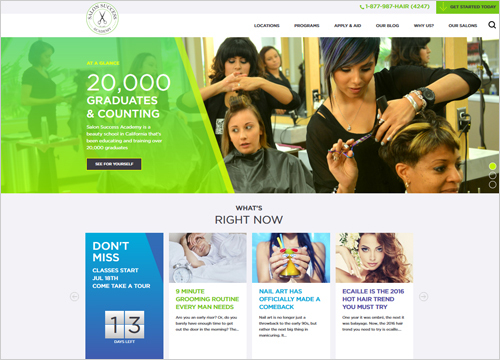 On June 9, 2016, we officially launched our brand new website along with a new look and feel for the entire Salon Success Academy community. We updated our look to reflect the passion, trends, and fashion that inspire our students and drive their creativity each and every day. From bright green and topaz blue to chrome edges, we’re excited to show off our new look. We’re still the same people helping company that you know and love. Now, just with brighter, vibrant colors to represent our exciting line of programs, including barbering, cosmetology, esthetics, and manicuring/nail care. Our new and improved website still offers all the great features with easy access to information about our educational partners, salon services and specials, our blog, and much more! Do you want to join the Salon Success community? Do you want to make the jump to your dream career in the beauty industry? We understand change can be hard. But, when you realize the reward, you too could experience success! When we launched our new website, we discovered change can actually be a good thing. Launch your new career and experience it for yourself! With over 20,000 graduates and counting, we’re proud to offer hands-on career training to aspiring professionals across California’s Inland Empire. Your future could start with us! Call 877-987-4247 to learn more.